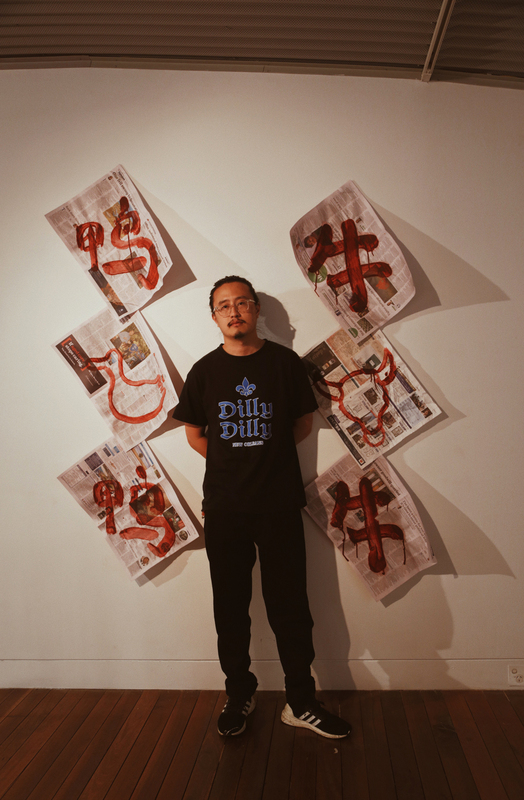 Sydney-based artist Jason Phu is prolific. You might recognise his distinctive, humorous style, where he blends painting, drawing and sculpture with a mass of intriguing contemporary installations centred on culture and identity to channel alternative histories. 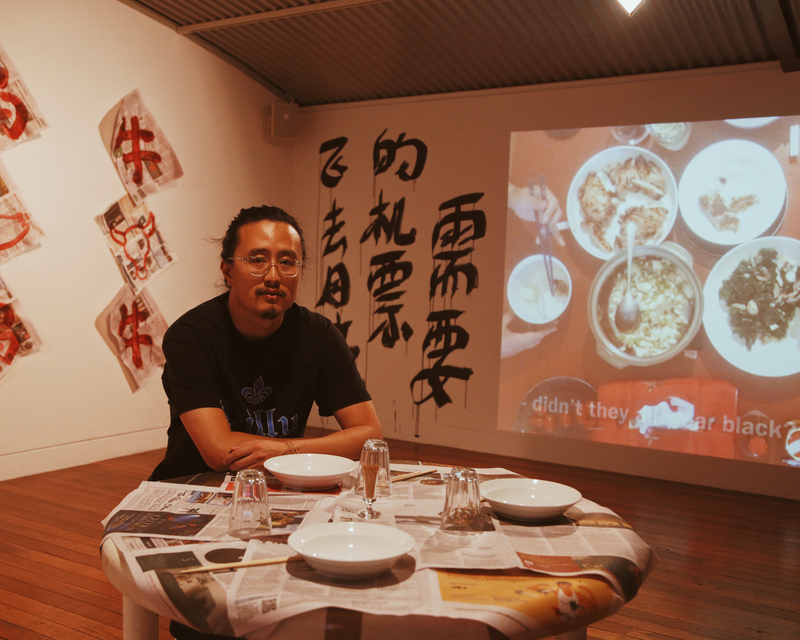 His work is pretty much everywhere, from state institutions like the Art Gallery of NSW to exciting new spaces like Cement Fondu and a whole bunch of smaller artist-run initiatives around Sydney. As far as artists go, Phu is high volume—averaging 15 shows a year, with several solo shows added to the mix. We spoke to him in the tailwind of two Sydney shows, a solo show titled I wake up from my midday naps with a terrible thirst at Chalk Horse, and a group show called Stop Peeping at Cement Fondu. Here, Phu talks poetry, inspiration, the emerging arts precinct in Kings Cross and what it's like to be a contemporary artist with a tonne of drive. First up, can you talk us through your two shows that opened in the last couple of weeks? My work at Chalk Horse was inspired by Buddhists and Zen paintings, which all really build up to my poetry – which drives my narratives. I get my inspiration from 18th Century Buddhist monks, copying their techniques of painting with stone, or inks and calligraphy; but then layering English and Chinese poetry into the mix and creating my own contemporary narrative. The work at Cement Fondu, which is a group show with other Asian artists I admire, curated by Megan Monte and Josephine Skinner, follows the other inspirations in my artworks, still with the poetry element, but reflecting on my identity politics; and my own family. This is something I like to draw out in my work. On a middle level, [the work] is talking about the perception of relationships in Australian-Asian families, and how this relates to sexuality and relationships. The artwork is a video which gives a bird’s eye view of my family at the dinner table. I want to conflict people’s assumptions of the migrant’s dinner table; it’s not how it looks in the soap operas! Jason Phu at Cement Fondu. We can see so many different elements throughout your career, from performance, painting, ceramics and printmaking. Where and what do you draw inspiration from? It’s a funny question for me actually, as I see making art as my career, rather than really drawing inspiration from anywhere. I like to create paintings about poetry or feelings, and the identity politics layered over the top, exploring the human condition. I’m a storyteller as well, relaying my parent's stories, my stories, religion. But I tend to work with the curator on what they’d like to create, they give me a theme, and I work with that. That’s a new way to consider being an artist. I guess, people forget it’s a job and instead think of how exciting it would be. I didn’t even really want to be an artist at first, always wanted to be a cartoonist! After that, an engineer. But I didn’t have the grades to continue with that one! And, luckily for me, an art school teacher pushed me to apply for an art degree, so it just started naturally. However, people do forget that it really is a job with long hours and not much pay—so you do have to enjoy it. Jason Phu and his installation for Stop Peeping at Cement Fondu. Does the work ever become overwhelming? I work really hard—it’s actually making me quite sick—I don’t know if I got it from my parents, because they work so hard as well. I’m putting in 70 hours a week, I need to remember that “self-care” thing. I was on a panel talking about this recently, working hard gets the results, you have advantages through your sacrifices. And, don’t get me wrong—being an artist means I can go off for a couple of hours for lunch, or go visit an opening. It’s about the balance, which I need to get better at. What are some of your favourite Sydney galleries? I have to say Firstdraft. I’m so proud to have them as a Sydney gallery, even though I haven’t anything to do with its successes, it always feels like a family art party at the openings. As an artist-run initiative, there is so much involved, and really, you need to be growing and being receptive to your audience to stay alive. There are also some great new galleries in Sydney, I’m seeing a real shift in the Kings Cross area for an arts precinct with Fine Arts, COMA Gallery in its new space; and Chalk Horse, who have a great new space too. The second exhibition, curated by Lauren Carroll Harris, is testing a new prototype project. I’m so flattered she’s picked me as the first artist. The theme will follow subscription-based video art, mine will be perfect for iPhone, as that’s how I shoot. I also have a solo show at Vermillion Gallery with a collection of Chinese paintings, made up of calligraphy and ink brush – exploring the simple aspects. And, finally, a performance at Campbelltown Arts Centre, as part of Real Real, curated by Jessica Olivieri, which involves a two-week residency, and then a live-streamed performance. Interestingly, there will not be a real audience, just a digital one. Stop Peeping is on show at Cement Fondu until 12 May. Here are all the exhibitions you need to check out this month.